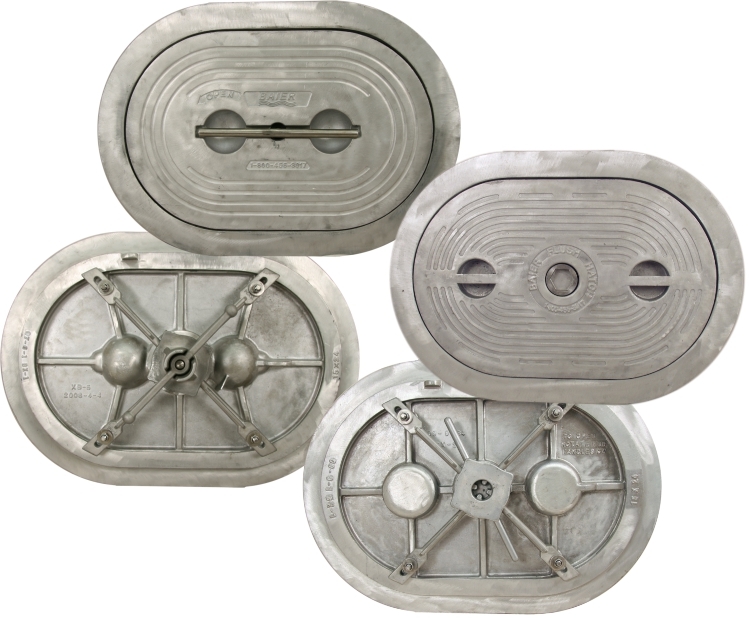 The oval hatches we offer are available as hinged or lift-out hatches. Also available with optional raised coamings or as a standard flush hatch. Cast from high-strength aluminum or cast steel. These hatches are also known as scuttles or access hatches in the Marine Industry. 15″ x 24″ Clear Opening (17″X26″ Cover) Oval Hex Centerbolt Style Hatch. HINGED 15″ x 24″ Clear Opening (17″X26″ Cover) Oval Hex Centerbolt Style Hatch. 15″ x 24″ Clear Opening (17″X26″ Cover) Built-In T-Handle Strongback Style Hatch. HINGED 15″ x 24″ Clear Opening (17″X26″ Cover) Built-In T-Handle Strongback Style Hatch. 15″ x 24″ Clear Opening (17″X26″ Cover) Built-In T-Handle Quick-Acting Style Hatch. Universl Steel Multi Dog Hatches.